Inspiring Graduate Stories: Joelle Appenrodt | American University Washington D.C.
Joelle Appenrodt recently won the SPA outstanding service award for undergraduates. Graduating from college is a time to reflect on everything you've learned. But one thing you've probably realized is that there's so much more knowledge to obtain. Joelle Appenrodt possesses that kind of curiosity, and she enjoyed being an undergraduate at American University. Now, she's decided to stay here a little longer. "I am not ready to leave the classroom. I really do love learning," she says. Appenrodt is finishing up her bachelor's degree in political science and CLEG from AU's School of Public Affairs. She'll remain at SPA to earn her master's degree in public administration. While attending graduate school, she'll continue in her current job at the Justice Department. "I think that AU and SPA have been incubators for my commitment to public service. I think I knew about that [interest] coming in, but this has really just strengthened my commitment," she explains. She's also earning a certificate in women, policy, and political leadership, and another certificate in advanced leadership studies. 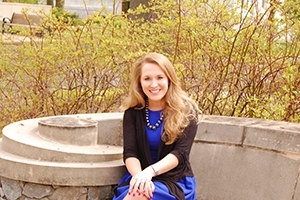 Appenrodt has been an award-winning student leader on campus. Yet without some encouragement years ago, she might never have attended college at all. During her junior year of high school, students filled out a survey about future plans, and she didn't check the "college" box. Appenrodt vividly recalls what happened next: "The assistant principal at my high school called me into her office, and she had the piece of paper on her desk. And she said, 'Joelle, you are going to college!'" She heeded her advice, eventually choosing AU and becoming the first person in her family to attend college. "I was fortunate enough to have a number of high school mentors, who were able to pass all sorts of opportunities my way and make sure that I was maximizing my potential," she says. Appenrodt was shaped by her environment and upbringing. She grew up in Marin County, California, an area with vast economic wealth disparities. She was a minority white student in a majority Latino high school in San Rafael. "I think that when you come to school, and you know that there were immigration raids in some of your classmates' communities last night, that is just an entirely different ballgame. And it made me so grateful for my education," she says. She's also faced her own obstacles over the years. When she was 13, another student leapt onto her back and caused fractured vertebrae. She's still coping with chronic back pain. "I'll reach a point in my life when I really do need to deal with it," she says. "But it's just part of my lifestyle, and I've learned to live with the pain." Appenrodt has been part of the SPA Leadership Program, which she calls her defining experience at AU. She served as a teaching assistant and eventually co-student director for the program. SPA Leadership Program Director Margaret Marr offers high praise for Appenrodt. "Joelle is just an extraordinary human being. I think she's the most organized person I've ever met," she says. Marr explains how other students have trusted and confided in Appenrodt. "She's helped a number of students through trying circumstances." During her first year, she took part in the SPA Undergraduate Research Symposium. She won the excellence in research award for a study on campus climate, as part of a group surveying nearly 400 AU students and delving into the matter of sexual assault. Appenrodt embraced a leadership role on this issue. She co-founded and became president of Stand Up AU, a student-run organization aimed at combatting sexual assault. When the university reconvened the Sexual Assault Working Group, she sat on the committee as a student representative. In addition, she was formerly chapter president of the Alpha Chi Omega sorority. Among other honors, she's been recognized with an American University Eagle Involvement award and the AU Fraternity and Sorority Life outstanding senior award. In late April, she won the SPA outstanding service award for undergraduates. As if all of that wasn't enough, Appenrodt got solid work experience. She interned in the district office of Rep. Jared Huffman, D-Calif. and worked with the National Organization for Women (NOW). She parlayed a Justice Department internship into her current job as a paralegal specialist in DOJ's Civil Division, Appellate Staff. She mentions one AU highlight that epitomizes experiential learning. In the fall of 2014, her Law and the Political System class was studying a Supreme Court case, National Labor Relations Board v. Noel Canning, which was about presidential power to make recess appointments. The next day, as part of her DOJ responsibilities, she was at the National Archives and Records Administration photographing evidence on the exact same case. "The learning in the classroom and the learning in D.C. were just colliding in the most perfect way possible," she remembers. "You always hear that D.C. is your learning laboratory. And in that moment, it absolutely was."